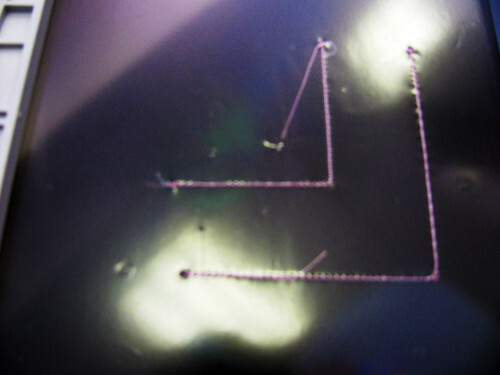 Lick and stick is a machine embroidery technique where only the water soluble stabilizer is put in the hoop. Then it is just slightly dampened as in licking a stamp. The fabric sticks to the stabilizer and can be embroidered without hooping. I didn’t stick my sample down really well, since licking in public was a little uncomfortable. I can see in the future using a damp sponge to better effect. I will post a photo of the finished design tomorrow. I didn’t get a good photo at the class. One interesting thing I learned was how easy it is to place a design using this method. 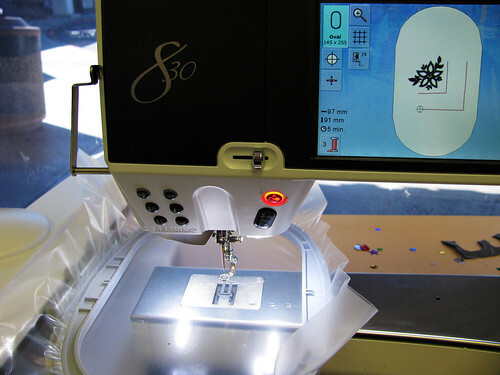 The little square doily was scanned into the computer, then brought into the embroidery software. 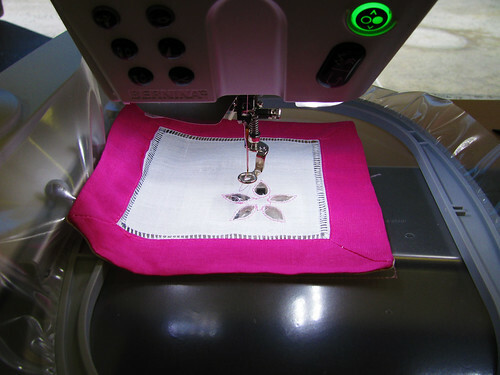 The edges of the corner where the embroidery is to be place are outlined and the designed is placed. Then the machine stitches out the lines on the stabilizer only. All I had to do was stick the doily on the stabilizer matching the lines. This method can be used for garment pieces too. I can see lots of possibilities, so I bought one of the machines. I am a little numb because the machine is a very big investment. I keep shaking my head to try and get some feeling back. This entry was posted on Sunday, October 18th, 2009 at 3:00 am and is filed under Embroidery and Sewing. Tagged: Embroidery, Sewing. You can feed this entry. You can leave a response, or trackback from your own site. Whoot!!! Congratulations! Can’t wait to hear all about it!